Artisteer for Windows 10 - graphic editor of site templates. The application includes a library of various design elements, uses automation tools and allows you to generate themes for cms joomla, drupal and wordpress. The utility is capable of extracting css stylesheets, contains sets of interactive buttons, menus and headers, and is able to create dynamic html code. The program includes a step-by-step wizard, supports hot-key functionality and an ftp connection, allows connecting third-party templates and workpieces, and can deploy ready-made projects to a valid site. 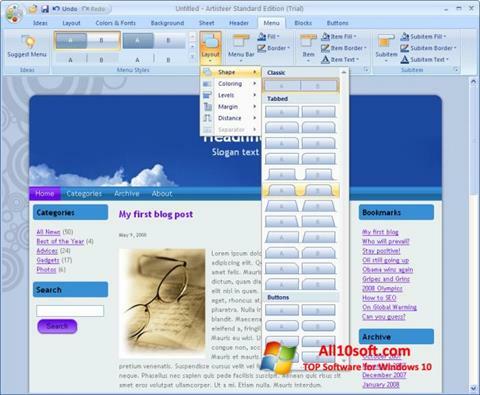 You can free download Artisteer official latest version for Windows 10 in English.